The glamorous human-rights jurist and hubby George Clooney are living in a Sullivan Street townhouse that has recently been hit with multiple violations for operating an illegal transient hotel, The Post has learned. The red-brick federal-style building that boasts two luxury rentals is less than two blocks away from Vogue editor Anna Wintour’s home. Amal Clooney, 40, is Wintour’s pal, co-chair of next month’s swanky Met Gala and appears on the May cover of the magazine. The London-based barrister is in the city for a stint as a guest professor at Columbia Law School and to help Wintour plan the annual fundraiser for the Metropolitan Museum’s Costume Institute. Over the last week, Clooney has dazzled the paparazzi with an array of designer outfits as she leaves the townhouse, where a one-bedroom apartment was on the rental market for $9,000 a month, according to listings. Husband George also has been seen exiting the building. But last month, the city slapped owner Richard Fertig with four violations for a basement apartment that was “illegally converted to transient use” without the required fire alarm, exits or certificate of occupancy. The duplex ground-floor and basement apartment, which boasts a wine cellar and chef’s kitchen was raided by the city’s Buildings Department last month while musician John Legend and his model wife, Chrissy Teigen, were living in the building, according to press reports. Legend and his pregnant wife, who is due in June, left the row house in haste last month after police and city officials entered the building. Teigen was wearing a bathrobe and slippers when she abruptly left. An e-mail to Clooney’s assistant at Columbia University went unanswered last week, but a spokeswoman from onefinestay in London, which rents short-term lodgings on behalf of clients around the world, said the company “follows all local regulations.” She would not comment on whether the Clooneys were staying in the townhouse. On trips to the city in the past, the Clooneys have stayed at the swanky Carlyle Hotel. Fertig, a former hedge-fund manager who describes himself in a YouTube video as a “serial entrepreneur” and an “Airbnb super host,” runs Short Term Rental University and provides online tips about how to maximize profits by renting out “rooms in your home” on vacation short-term stay sites. He said he has six luxury properties that he rents out on Airbnb and VRBO, according to a YouTube post. City rules prohibit building owners from engaging in short-term rentals — for less than 30 days — unless they live on the premises. Fertig owns a home in the Hamptons in addition to the Sullivan Street townhouse, public records show. A Department of Buildings hearing on the violations is scheduled for Thursday. A spokesman for the mayor’s office said the city is carrying out “aggressive enforcement” against landlords who break the law. “In many cases, guests are also victims of fraudulent marketing and are being illegally rented units that are not set up for short-term stays, which is potentially dangerous,” said Patrick Gallahue, a City Hall spokesman. Fertig, who has owned the Sullivan Street property since 2007, did not return requests for comment. David Pressman, who represents the Clooneys, did not return a call for comment. Does anyone know if that's the original wedding band Amal is wearing in this picture? It looks like it, it is a thin diamond band. It does look like it . The rental owner has received multiple building violations and was raided by police and city officials last month. The latest celebrity couple to stay at a Soho rental recently raided by authorities seems to have no inkling as to the townhouse’s sordid past. The New York Post reports that the Sullivan Street property they’re renting is owned by Richard Fertig, a self-described “serial entrepreneur” who focuses on managing short-term rentals and seems to attract celebrity clientele — if its recent occupants are any indication. Last month, John Legend and Chrissy Teigen were staying at the rental property until they left suddenly after city officials from the Department of Buildings and police raided the apartment due to several building violations related to an “illegally converted” basement apartment. Authorities say the low level unit does not have proper exits, a fire alarm or certificate of occupancy. The raid came amid the city’s “aggressive” crackdown on landlords violating laws, as the Post reports, and the Clooneys did respond to questions from the paper. 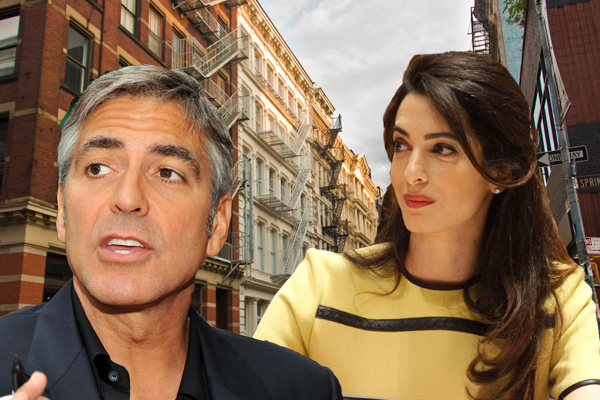 [size=18][size=18]Amal Clooney may be a brilliant international lawyer, but she appears to have no clue she is staying in a shady Soho rental. Very much Fox News - and they can spread this far and wide, especially with the John Legend Chrissy Teigen names to add to the mix. Not to start trouble, but these illegal rentals are a problem for the city and it's no secret that the owner of this one is being taken to court for violations of building codes. If G&A didn't know about it I'm sure their NY friends did. They should have recommended another rental or G&A should have stayed at the Carlyle, like they usually do. Maybe someone liked the look of the brownstone backdrop for her morning pap shots. Could be it was suggested by someone who lives nearby? Intriguing that they went to David Pressman for comment - maybe it was he who booked it? Have to say when I stayed in NYC the Airbnb was less than satisfactory and I think it's going to be a problem elsewhere 'cos the owners turn out not to be the owners at all but of a massive syndicate and I do remember that the authorites were trying to bring in some new legislation about it then - plus many of them are only available for a month at the least. party animal - not! wrote: intriguing that they went to David Pressman for comment - maybe it was he who booked it? I was wondering the exact same thing! They must know Pressman isn't his publicist, surely? Unless he has been doing some talking to the press on behalf of George in the past on the side? the kids and their nanny. If the problem is the basement apartment that may be how they could rent it. They probably only rented the top floors to George and Amal. Annemarie - I think it's the other way around. It seems there's an apartment upstairs and a duplex that includes the ground floor and basement with access to the garden. Staying at the Carlyle would have been too public?! And this place isn't? PAN - They're trying to change legislation because these Airbnb rentals are taking residential housing off the market and hurting the hotel business as well. Often these places don't meet safety codes that are required of transient housing. Bottom line, I don't think G&A (or the people acting for them) didn't know the situation. They just didn't care. I don't see George or Amal willingly doing anything that would endanger themselves or their children. I also think they would take the violations seriously . The article says the fines were for the basement apartment which is illegal. It would seem that can be rented separately and that is the problem having someone in there is unsafe not the rest of the duplex. For the privacy of the kids yes it is better as I said the kids can be taken in the back yard where the paps can't get at them. Where as the Carlyle has too many people around who could inform the paps what the kids and the nanny look like. Which I can see happening not everyone would respect their privacy. I think G&A would definitely care about these rental violations. Any guess as to how much longer Amal needs to be in NY? Guess we have to stay tuned as to what happens next. The Met Gala is in early May, so she will probably be here until then I would guess. Donnamarie - The brownstone is a row house. It appears the owners have divided the interior into separate apartments, one of which is a two storey (duplex) that includes the ground floor and basement. PAN-The safety code violations don't mean that the house is unsafe to live in. It means that they don't meet the safety codes required for transient housing which are different than residential codes. The law also states that you can't rent portions of your home for less than 30 days without violating the law so I expect G&A to be there for at least a month and possibly longer, depending on when her stint a Columbia ends. Thanks Lizzy. I’m a little slow in understanding the physical layout of this building. I think I’ve got it ... now. But were Legend and his wife staying in the same apartment as George and Amal seem to be occupying? Donnamarie - Not sure, but I would think so. That seems to be the part of the house that the owners are renting out. Can you imagine a celebrity renting part of the house while someone else is living in the other apartment? Maybe that's where the nanny and the staff live? That would make sense, Lizzy. Also can't see the Clooneys sharing a house with strangers. Perhaps they weren't aware of the violations? I know this may sound silly but unless they did a google search, would they even know that it was THIS house that was busted? Even if they did, it seems the violations aren't for something major, rather a breach of coding that doesn't impact the quality of the home? Exactly, katie the problem is the the illegal renting of the basement as an apartment. Annemarie - Don't mean to quibble, but it's more than that. The very fact that the owners are using a residential property as a transient rental (basically a hotel) is illegal. Also, there are safety codes that apply to hotels that don't apply to private homes and apparently they're in violation of those codes. Katie - A. G&A might not have known, but there's no way their friends didn't - especially after Chrissy Tiegen and John Legend left in their pyjamas during a police raid. It was all over the news here. B. A lawyer who claims to take the moral high ground shouldn't be ignoring the law because it's personally convenient. Is that what she's teaching at Columbia? I don’t think we should jump to conclusions. We don’t know anything other than the few details revealed in news reports. We don’t know that Amal and George are ignoring the law. We don’t know what is going on behind the scenes. Yes their friends may have known but who says they told anyone where they were going to be living. If there were a real problem , I don't think they would be still staying there. Neither George or Amal would go against the law. Hey, Lizzy I think we are seeing things differently what I am getting is it is the basement that is being rented as an apartment is the problem not the whole building. They went through the whole building and the basement was the problem. I think we will know by Friday what the out come was, that is if it gets out. My guess the owner will be fined and have to install a fire alarm which probably has already been done. probably wouldn't be allowed to do. Annemarie - My impression is that the ground floor and basement are being rented as a duplex apartment to allow tenants access to the wine cellar and garden. We'll have to agree to disagree on this. I don't believe Anna Wintour didn't know where they were going to be staying. I also don't believe she was unaware of the legal situation. IMO, whether they knew about it in advance or not, their staying there doesn't look good. Yeah, agree that they'll probably have to move - whether they knew about it or not, now it's out (again) they can't really stay there. That's assuming that that's where they're living. I still have my doubts. Think it's being used as a daytime staging post for the paparazzi to find. It's possible she is using it for her meetings and going home to the kids and George when the work is done. Which gives the kids privacy and they aren't bothered by the paps. Do you really think they'd go to such extremes? Besides, if they're not staying there where are they staying? How come no one's spotted them anywhere else? And how does Amal get to Sullivan St. every morning without a pap parade? Do they smuggle her there in a suitcase? I can't imagine they could convince all the paps to leave them alone in exchange for Amal's morning poses. Sorry, but I believe they're staying there and either have decided to stay because it's convenient or they're deciding where they want to move to next. I have pretty much thought all along that this residence was really more of a work place for Amal than an actual residence. I can’t imagine the children being cooped up at this house even if they did have a courtyard in the back for fresh air. But none of us have been able to figure out what the story is. Bottom line, I don’t think Amal and George would knowingly break city laws just for their own convenience. Time will tell , if they have to move I'm sure they will. I simply don't believe either of them would break laws. They aren't breaking the law, the building owner is. They're just unwitting (or witting) dupes who got caught in the middle. It just doesn't look good for them to be living in an illegal residence - and by now they have to know about the legal situation since The Post called them out on it. LizzyNY wrote: Do you really think they'd go to such extremes? I think it's possible, yes. If it keeps all other comings and goings private and if she's using it as office space anyway . . .
LizzyNY wrote: Besides, if they're not staying there where are they staying? Ahh, that's the million dollar question, isn't it? LizzyNY wrote: How come no one's spotted them anywhere else? Filing that under how come no one's seen George Clooney anywhere the past 7 days. I assume he hasn't disappeared into the ether, either. LizzyNY wrote: And how does Amal get to Sullivan St. every morning without a pap parade? Do they smuggle her there in a suitcase? I can't imagine they could convince all the paps to leave them alone in exchange for Amal's morning poses. I think they would. They've got other places to be, and I think if they were reassured that they need be outside for, say 10am, then they'd show up around that time, take the pics and go. No need to stake out a house 24-hours if they're promised the pictures they need. I also don't think it's a lot of paps - maybe just a couple of photogs. LizzyNY wrote: Sorry, but I believe they're staying there and either have decided to stay because it's convenient or they're deciding where they want to move to next. Yeah, could well be too. Either way, I'd guess it's going to take them a little while to decide where to move next. Last day of law school classes is next week-- so if they live there may not be worth moving if they don't plan to stay in NY after that. Well, they have to be here for the Met ball so either they'll leave and come back or they'll have to decide whether to move or not. I have a feeling they might just stay where they are until they leave for Italy. But George was seen leaving with suitcases from there. If they don't live there, why the suitcase? Even if he just wanted to say goodbye to her, the bags would already been in the car. .....It's fun to know that they have them aye ?? luggage into the "trunk" .....or our "boot" .......of their rental car. It made us both laugh that rich people had problems like that. Just brought back a memory.